This is the third phase of releases in under a month, with the number of detainees returned to society now totalling more than 120. 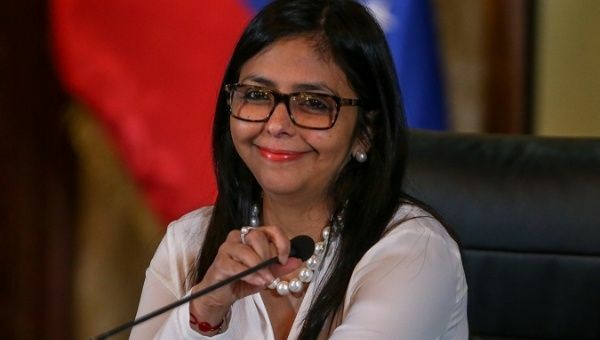 June 13 (teleSUR) Venezuela is poised to release a further 43 opposition politicians and activists accused of inciting violent protests in 2014 and 2017 which killed nearly 200 people, National Constituent Assembly (ANC) President Delcy Rodriguez confirmed Wednesday. “This process was realized for the sake of the national dialogue, of reconciliation, of the meeting between Venezuelans. It is a measure made at the request of President Maduro,” she told the ANC. Additionally, Madura requested those being released abandon their violent ways. This is the third phase of releases in under a month, with the number of detainees returned to society now totalling more than 120, according to the Psychology Federation of Venezuela (FPV). Various benefits are being offered to those released, depending on the severity of the allegations against them, as part of a cooperation strategy to end political violence, remove blockades and achieve national peace, Communications Minister Jorge Rodriguez said last week. Following the first meeting of the Federal Council of Government in Caracas with state ministers last month, President Nicolas Maduro reiterated his call for a “great peace dialogue” and demanded any resolutions for peace be noted in writing.